Calling all fans of Universal Orlando Resort! Tune in to Access Hollywood daily between June 25 and June 29, 2018, and look for the Access Hollywood Sweepstakes Word Of The Day. 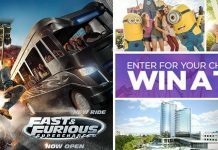 You could win a family vacation trip to Universal Orlando Resort to experience the all-new ride Fast & Furious – Supercharged and be among the first to stay at Universal’s Aventura Hotel, opening this August. The daily code word is needed to enter Access Hollywood Universal Orlando Resort Vacation Sweepstakes. If you can’t watch the show or simply missed the word, be sure to come back here to find it below. You’re welcome! The Access Hollywood Universal Orlando Resort Vacation Sweepstakes is open to legal residents of the 50 United States and the District of Columbia, who are 18 years of age or older. This Sweepstakes begins on June 25, 2018 at 1:00 P.M. PT and ends on June 29, 2018 at 11:45 P.M. PT. You may enter once per day throughout the Sweepstakes Period. Estimated Retail Value of Prize is $3,701.44. For complete details, see official rules starting June 25, 2018. Anyone know the word of the day? I just missed the word tonight. How can I find it? Does anyone know it yet?